Violin Mutes : Which one to buy? Violin mutes are violin accessories that are attached onto the violin bridge while playing, or during practicing. The mutes are used to lower the volume and tone produced by the violin. The violin mute works by restricting the amount of vibrations transmitted throughout the violin. By ‘grabbing’ hold of the bridge, the bridge will vibrate less and volume produced will be softer. 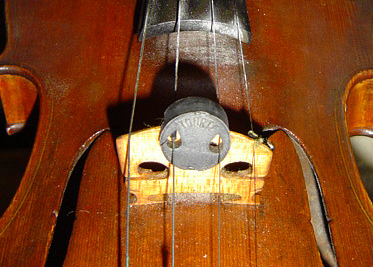 Violin mutes are attached to lower the volume of the violin. It can be used during practicing, especially in the wee hours of morning when others are sleeping. Lowering the volume will aid in not disturbing others. Violin mutes are also used in practice, especially in orchestra where there are many fellow violin players. Hence, when one wishes to practice his parts of pieces, they are recommended to mute their violin so as not to disturb others. Violin mutes are also used for orchestras when they are playing certain pieces which require softer tones. These will mute the volume produced by individual violinists, and allow the whole orchestra to contain its volume. There are mutes for different string instruments. The size of the mutes depends on the size of the bridge it’s put on. Though you can buy mutes of different shapes and sizes, here’s some tips on violin mutes for you. 1. You would want to test out the difference the violin mute makes to your violin. Check if your violin did become softer after you mute it, or didn’t. Or did your violin become too soft after muted (till you can’t even hear yourself playing). 2. You would want a violin mute that is easy to use. It can be easily plugged onto the violin bridge, and easily removed without moving the bridge. The violin bridge should grip the bridge, but not too hard that it will move the bridge when removed. 3. You would want a mute that looks nice on your violin. This would apply more for concert violinists using mutes for pieces. Check out the latest violin mutes available at your Violin Music Shop! Look out for special deals and discounts too! Violin Music School offers one-to-one private violin lessons for kids and adult students. Enjoy learning the violin at your own pace without stress. Drop us your enquiry here!